Louanne “Kat” Katraine: Eager to transcend the station of rookie Viper pilot, Louanne “Kat” Katraine competes against her former instructor, Kara “Starbuck” Thrace. Louanne “Kat” Katraine is clad in a green pilot uniform. 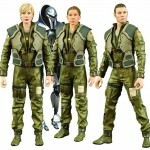 Battlestar Galactica Series 2 figures feature multiple points of articulation and is set in 7″ scale.